Creation: Appeared in July 1933 as a renumbering of part of VA 512. It initially ran from US 60/VA 27 (now just County Dr) Phoebus east to Buckroe Beach waterfront at the end of Pt. Comfort Dr. This is the only VA 169. VA 512 out to Buckroe. VA 169 out to Buckroe. 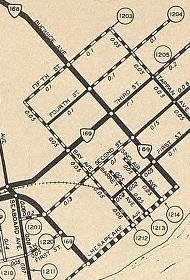 Adjustments: In Aug 1934 (CTB), VA 169 was extended north along the Buckroe waterfront, then west on Buckroe Ave to 3rd St south (where VA 168 ended), then over Seaboard Ave back to end at VA 169 (current Mallory-Pt. Comfort Ave jct), forming a giant square onto itself. In Oct 1966 (CTB), VA 169 was extended west along VA 351, then replaced VA 167 on Old Buckroe Rd and Fox Hill Rd west to end at VA 278. Officials imply it went to US 258 Mercury Blvd then but it did not. 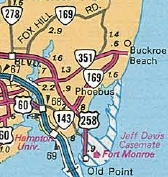 In Aug 1975 (CTB), VA 169 was rerouted at Buckroe Beach to its current routing using Mallory to Pembroke directly without looping around the waterfront area. Some of this loop is no longer drivable road. The CTB still referred to the loop at its decommissioning as VA 169 but it seems to me it should've been 169Y from 1966-75. In March 1979 (CTB), VA 169 was extended west over VA 143 to Mellen St in Phoebus to end at the rerouted VA 143. In Nov 1980 (CTB), VA 169 was rerouted away from VA 278 to end at US 258 as it does now, leaving behind Old Fox Hill Rd. In 1983 or 1984, VA 169 was extended as new primary routing from VA 143 west to I-64/US 60. VA 169 loops onto itself. VA 169 extended to VA 278. Improvements: VA 169 was paved upon inception. 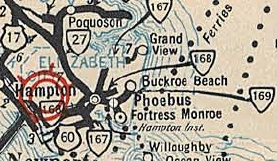 VA 169 was multilaned from Phoebus to Buckroe in 1950. 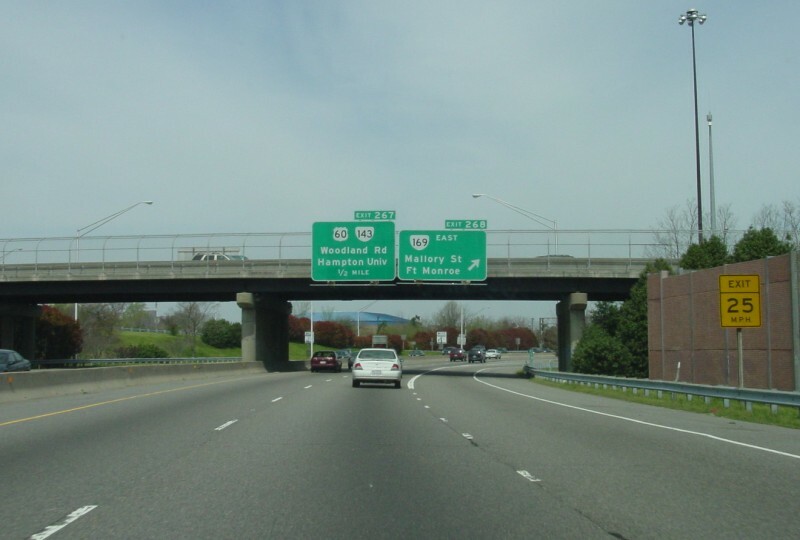 VA 169 was multilaned from Mercury Blvd to Old Fox Hill Rd upon opening in 1980. Fox Hill Rd is 4-lane undivided for all of its VA 169 run, but maps do not show it as multilaned at all so it is unclear when this came to be. Posted: Somewhat fully posted: From Mallory there is no signage to turn onto Pembroke/VA 351; Old Buckroe NB there is an erroneous sign indicating 169 South runs east on Fox Hill; additionally, there is no sign to tell you to turn from Fox Hill Rd to Old Buckroe Rd on VA 169 SB. Other names: Mallory St (I-64 to Buckroe); Pembroke Ave (VA 351 duplex); Old Buckroe Rd/Fox Hill Rd (VA 351 to Mercury Blvd). Comment: VA 169 forms a 270 degree loop in eastern Hampton. From 1966-75, VA 169 had a through routing in Buckroe while still having the loop at the waterfront. Was the loop really VA 169Y during this time? Does anyone have a VDOT map of Hampton in this timeframe?